Do not transport any heavy, sharp-edged or fragile bottles in the stowage compartments. In the event of an accident, the stowage compartments cannot secure the bottles adequately. You and/or other vehicle occupants could be injured. The stowage compartments in the doors have space for bottles containing up to 34 fl. oz. The bottles are neither secured in position nor prevented from tipping over. Therefore, do not place any open drink containers in the stowage compartments. You can remove the cup holder's rubber mat for cleaning. Clean with clear, lukewarm water only. – To open: slide cover 2 fully forwards. 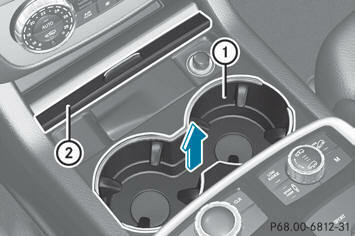 When you use the warming function, the metal insert of the cup holder is heated. Therefore, do not touch the cup holder insert. Otherwise, you might burn yourself. The temperature-controlled cup holder can be used to keep cold drinks cool and warm drinks warm. – To switch on cooling function: press switch 3 repeatedly until the blue indicator lamp in the switch lights up. – To switch on warming function: press switch 3 repeatedly until the red indicator lamp in the switch lights up. – To switch off function: press switch 3 repeatedly until the indicator lamp in the switch goes out. When using the warming function above a certain temperature, residual heat indicator lamp 2 lights up. This means that the metal insert of the cup holder is hot. Do not sit on or support your body weight on the rear seat armrest when it is folded down, as you could otherwise damage it. Cup holder 1 is in the rear seat armrest. 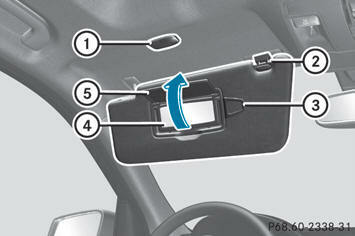 Mirror light 1 only functions if the sun visor is clipped into retainer 2 and mirror cover 5 has been folded up. – Fold down sun visor 1. – Pull sun visor 1 out of retainer 3. – Swing sun visor 1 to the side. 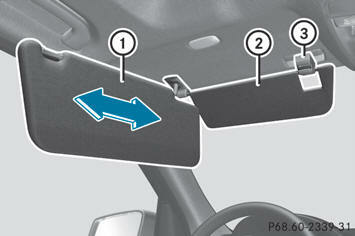 – Slide sun visor 1 forwards and back as required. – Fold down additional sun visor 2. – To open: slide cover 1 fully forwards. – Fold the lid of insert 3 upwards. – To remove the insert: press insert 3 to the left 4. Ashtray insert 3 slides out slightly to the right. – Lift insert 3 up 2 and out. 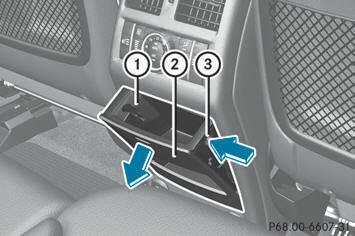 – To install the insert: install insert 3 into the holder and press down on the righthand side until it engages. – To open: briefly press cover 2 at the top. – To remove the insert: press into recess 3 from the right. – Lift insert 1 up and out. – To install the insert: install insert 1 into the holder and press down on the righthand side until it engages. – Press in cigarette lighter 2. – To close: pull cover 1 fully back. With the exception of the socket in the front center console, all sockets can be used for accessories with a maximum current draw of 240 W (20 A), e.g. lamps or chargers for mobile phones. The socket in the center console in the front compartment can be used for accessories, e.g lamps or mobile phone chargers with a maximum current draw of 180 W (15 A). – Turn the SmartKey to position 1 in the ignition lock. – Lift up the cover of socket 1. The 115V AC socket operates at high voltage. Use the 115V AC socket in the vehicle with the same caution and prudence that you exercise when using power outlets at home. Keep any fluids away from the 115V AC socket. Do not clean the socket with fluids or tapered objects. Keep the 115V AC socket cover in the closed position, when not in use. Otherwise, you could suffer an electric shock and be seriously or even fatally injured. If the 115V AC socket is damaged or torn out of the trim, do not use or touch the 115V AC socket. Using a 115V AC socket that is damaged or torn out of the trim could cause serious personal injury to you and/or others. 115 V socket 1 provides an alternating voltage of 115 V, so that small electronic devices can be connected. These devices, such as games consoles, chargers and laptops, together should not consume more than a maximum of 150 W.
Requirements for operation of these devices: - the plug of the electronic device must be inserted fully into 115 V power socket 1. - the maximum wattage of the device to be connected must not exceed 150 W.
- the on-board power supply is within a permissible volt range. – Insert the plug of the electronic device into 115 V power socket 1. If indicator lamp 2 does not light up, consult the section on malfunctions. – To turn off: disconnect the plug from 115 V power socket 1. Possible causes of malfunction: - the on-board power supply is not within a permissible volt range. - the temperature of the DC/AC converter is temporarily too high. - some small electronic devices have a constant nominal power of less than 150 W, but a very high inrush current. These devices will not work. If you connect such a device, 115 V power socket 1 will not supply it with power. If indicator lamp 2 still does not light up, contact a specialist workshop, e.g. an authorized Mercedes-Benz Center. MB Info call button to register. If any of the steps mentioned is not carried out, the system may not be activated. Shortly after successfully registering with the mbrace service, a user ID and password will be sent to you by post. You can use this password to log in to the mbrace section under "Owners Online" at http:// www.mbusa.com. The mbrace system is available if: - it has been activated and is operational. - the corresponding mobile phone network is available for transmitting data to the Customer Center. - a service subscription is available. - the starter battery is sufficiently charged. – Use the volume controller of the audio system/COMAND. You can find further information and a description of all available features under "Owners Online" at http://www.mbusa.com. - the indicator lamp in the SOS button does not light up during the system selfdiagnosis. Roadside Assistance button does not light up during the system self-diagnosis. information button does not light up during selfdiagnosis of the system. - The Tele Aid Inoperative or Tele Aid Not Activated message appears in the multifunction display after the system selftest. An mbrace emergency call that has been initiated automatically cannot be terminated by the customer. Once a connection has been established, the Call Connected message appears in the multifunction display. Shortly after the emergency call has been initiated, a voice connection is automatically established between the Mercedes-Benz Customer Assistance Center and the vehicle occupants. If the vehicle occupants respond, the Mercedes-Benz Customer Assistance Center attempts to get more information on the emergency. If no vehicle occupant answers, an ambulance is immediately sent to the vehicle. If the indicator lamp in the SOS button is flashing continuously and no voice connection to the Mercedes-Benz Customer Assistance Center was established, then the mbrace system could not initiate an emergency call (e.g. the relevant cellular phone network is not available). – To initiate an emergency call manually: press cover 1 briefly to open it. – Press SOS button 2 briefly. – Wait for a voice connection to the Mercedes-Benz Customer Assistance Center. – After the emergency call is ended, close cover 1. If you feel in any way in jeopardy when in the vehicle (e.g. smoke or fire in the vehicle, vehicle in a dangerous road location), please do not wait for voice contact after you have pressed the SOS button. Carefully leave the vehicle and move to a safe location. The Mercedes-Benz Customer Assistance Center will automatically contact local emergency officials with the vehicle's approximate location if they receive an automatic SOS signal and cannot make voice contact with the vehicle occupants. – Press and hold Roadside Assistance button 1 for more than two seconds. This initiates a call to the Mercedes-Benz Customer Assistance Center. The indicator lamp in Roadside Assistance button 1 flashes while the call is active. The Connecting Call message appears in the multifunction display. The audio output is muted. If a connection can be established, the Call Connected message appears in the multifunction display. – Describe the type of assistance needed. The Mercedes-Benz Customer Assistance Center either sends a qualified Mercedes- Benz technician or organizes for your vehicle to be transported to the nearest authorized Mercedes-Benz Center. You may be charged for services such as repair work and/or towing. Further details are available in your mbrace manual. The mbrace system failed to initiate a Roadside Assistance call if: - the indicator lamp in Roadside Assistance button 1 is flashing continuously. - no voice connection to the Mercedes- Benz Customer Assistance Center was established. – Press the corresponding button for ending a phone call on the audio system or on COMAND. – Press and hold MB Info call button 1 for more than two seconds. This initiates a call to the Mercedes-Benz Customer Assistance Center. The indicator lamp in MB Info call button 1 flashes while the connection is being established. The Connecting Call message appears in the multifunction display. The audio output is muted. Further details on the mbrace system can be found under http://www.mbusa.com. Log in under "Owners Online". - the indicator lamp in MB Info call button 1 is flashing continuously. button on the multifunction steering wheel or the corresponding button for ending a telephone call on the audio system or on COMAND. If an mbrace call is initiated, audio output is muted. The mobile phone is no longer connected to COMAND. However, if you want to use your mobile phone, we recommend that you do this only when the vehicle is stationary and in a safe location. Information on the components and operating principles of COMAND can be found in the separate COMAND operating instructions. Destination Download gives you access to a database with over 15 million points of interest (POIs)/important destinations that can be downloaded onto the navigation system of your vehicle. If you know the destination, you can download the address or obtain the location of points of interest (POIs)/important destinations in the surrounding area. The customer service representative determines a suitable driving route based on your current vehicle position and the desired destination and guides you live through the current sections of the route. If you have unintentionally locked your vehicle (e.g. the SmartKey is still in the vehicle) and a replacement SmartKey is not available, the vehicle can be opened by a Mercedes-Benz Customer Assistance Center. The vehicle can be opened remotely up to four days after the ignition was last switched off. – Return to your vehicle at the time agreed upon with the Mercedes-Benz Customer Assistance Center. – Pull the tailgate handle for at least 20 seconds until the indicator lamp in the SOS button (Y page 300) flashes. Alternatively, the vehicle can also be opened via the Internet or an iPhone in the "Owners Online" section using your ID number and password. Vehicle remote unlocking is only possible if the corresponding mobile phone network is accessible. The SOS button flashes and the Call Connected message appears in the multifunction display to confirm that the command for vehicle remote unlocking has been received. If you pull the tailgate handle for more than 20 seconds before receiving authorization for remote unlocking from the Mercedes- Benz Customer Assistance Center, you must wait 15 minutes before you can pull the tailgate handle again. If you forget to lock your vehicle but are no longer in the vicinity of the vehicle, it can be locked for you by the Mercedes-Benz Customer Assistance Center. The vehicle can be locked remotely up to four days after the ignition was last switched off. The next time you are in your vehicle and switch on the ignition, the Tele Aid: Doors Locked by Remote message appears in the multifunction display. Alternatively, the vehicle can also be locked via the Internet or an iPhone in the "Owners Online" section using your ID number and password. The vehicle valet locking feature is available when the relevant mobile phone network is available and data connection is possible. – This number will be forwarded to the Mercedes-Benz Customer Assistance Center together with your PIN. If the anti-theft alarm system is active for longer than 30 seconds, mbrace automatically informs the Mercedes-Benz Customer Assistance Center. Do not use the integrated remote control with any garage door opener that lacks safety stop and reverse features as required by U.S. federal safety standards (this includes any garage door opener model manufactured before April 1, 1982). A garage door that cannot detect an object - signaling the door to stop and reverse - does not meet current U.S. federal safety standards. Only press the transmitter button on the integrated garage door opener if there are no persons or objects present within the sweep of the garage door. People could otherwise be injured by the movement of the door. Garage door remote control 5 is not part of this integrated garage door opener. To achieve the best result, insert new batteries in garage door remote control 5 before programming. – Before programming for the first time, clear the memory of the integrated garage door opener. – Press and hold one of transmitter buttons 2 to 4 on the integrated garage door opener. Indicator lamp 1 starts to flash yellow after a short period. Indicator lamp 1 flashes yellow immediately after the transmitter button has been stored for the first time. If the transmitter button has already been programmed, indicator lamp 1 does not flash yellow until 10 seconds have elapsed. – Release the transmitter button. – Point transmitter button 6 of garage door remote control 5 towards the transmitter buttons on the rear-view mirror at a distance of 2 to 8 inches (5 to 20 cm). The distance required between garage door remote control 5 and the integrated garage door opener depends on the system of the garage door drive. You might require several attempts. You should test every position for at least 25 seconds before trying another position. – Press and hold transmitter button 6 on garage door remote control 5 until indicator lamp 1 lights up green. Programming is complete if indicator lamp 1 lights up or flashes green. – Release transmitter button 2, 3 or 4 on the integrated garage door opener and the transmitter button on garage door remote control 6. – Repeat the programming procedure for the transmitter button. When doing so, vary the distance between the garage door remote control and the rear-view mirror. If the indicator lamp flashes green after successful programming, the garage door system is operating on a rolling code. After programming, you must synchronize the garage door opener integrated in the rearview mirror with the receiver of the garage door system. Your vehicle must be within range of the garage or gate opener drive. Make sure that neither your vehicle nor any persons/objects are present within the sweep of the door or gate. Observe the safety notes when performing the rolling code synchronization. – Press the programming button of the door or gate drive (see the door or gate drive operating instructions, e.g. under "Programming of additional remote controls"). You now normally have 30 seconds to initiate the next step. – Press the previously programmed transmitter button of the HomeLink® integrated garage door opener repeatedly in succession until the door opens. These signals may not therefore last long enough for the integrated garage door opener to recognize the signal during programming. Comparable with Canadian law, some U.S.
garage door openers also have a built-in "interruption". 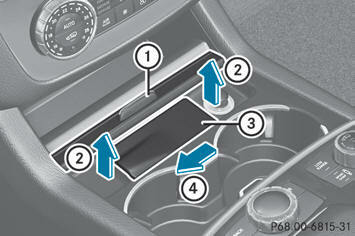 – Press and hold one of transmitter buttons 2 to 4 of the integrated garage door opener. – Press transmitter button 6 of the garage door remote control and hold for two seconds, then release for two seconds, then press again and hold for two seconds. – Repeat this sequence on transmitter button 6 of the garage door remote control until indicator lamp 1 is green. Repeat the process if indicator lamp 1 turns red. – Continue with the other programming steps (see above). If you are experiencing problems programming the integrated garage door opener on the rear-view mirror, take note of the following instructions: - check the transmission frequency of garage door remote control 5 (usually found on the reverse side of the remote control). The integrated garage door opener is compatible with devices that can be operated with units in a frequency range of 280 to 390 MHz. - change the batteries in garage door remote control 5. This increases the probability that garage door remote control 5 will send a strong and precise signal to the integrated garage door opener on the rearview mirror. - when programming, hold garage door remote control 5 at different distances and angles from the transmitter button that you are programming. Try different angles at a distance between 2 and 12 inches (5 to 30 cm) or the same angle at varying distances. - if another remote control for the same garage door drive is available, repeat the same programming steps with this remote control. Before you perform the steps of the operation, make sure that there are new batteries in the garage door remote control. - note that some remote controls only transmit for a limited amount of time (the indicator lamp on the remote control goes out). Press the remote control button again before it stops transmitting. - align the antenna cable of the garage door opener unit. This can improve signal reception/transmission. Once programmed, the integrated garage door opener will assume the function of the garage door system's remote control. Please also read the operating instructions for the garage door system. – Press transmitter button 2, 3 or 4 in the overhead control panel that you have programmed to operate the garage door. The transmitter will transmit a signal for as long as the transmitter button is being pressed. After a maximum of ten seconds, transmission is terminated and indicator lamp 1 flashes yellow. Press the transmitter button again, if necessary. – Press transmitter buttons 2 and 4. – Press and hold transmitter buttons 2 and 4 until the indicator lamp turns green. – Driver's seat/front-passenger seat: slide the respective seat back. – Rear seats: slide the respective seat forwards. – To install: place the floormat in the footwell. – Press studs 1 onto retainers 2. – To remove: pull the floormat off retainers 2. In order to operate radio-controlled equipment, e.g. toll recording systems, areas 1 on the windshield are permeable to radio waves. In these areas, you can install radio-controlled systems.